Ninh Thuan, the land of sun and wind, has always attracted tourists with a long and charming coastline, from Ca Na to Ninh Chu, Vinh Hy and Binh Tien... all of them bring a wild, rustic beauty because they are not affected much by tourism activities. However, if you just stay in Ninh Thuan in one day, you can fully explore all the beauty of the land and people of Ninh Thuan through the highlights of Phan Rang city. 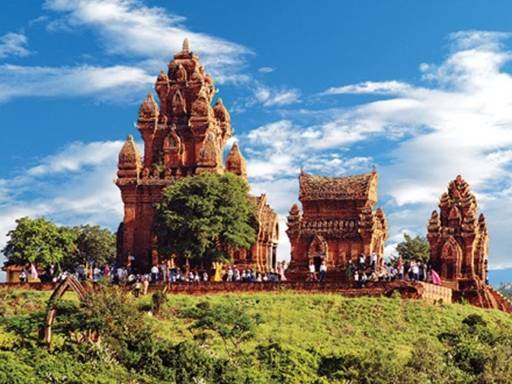 From the downtown of Phan Rang, going up to the north, crossing Cham tower station, visitors will admire Poklong Garai system including the main tower worshipping King Poklong Garai, the eastern gate tower and tower worshipping the God of Fire. After more than seven centuries, Poklong Garai marked the development of Panduranga dynasty and is a major religious, faiths place of the Cham. The most appropriate time for tourists to visit Poklong Garai is from 7am - 9am when the sun is not too harsh. 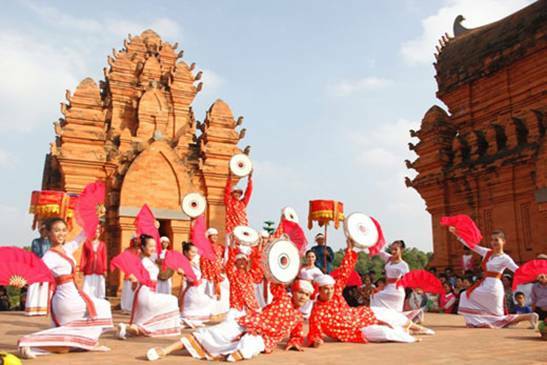 Additionally, you can choose to visit Ninh Thuan in September to enjoy the atmosphere of Kate festival. This is a big and important annual event of Cham people in this area. Admission fee is 30,000 VND per person. Besides Cham system tower, visitors can take time to visit the Cham Museum with unique exhibits of artistic value. Guests do not need to go out of town to visit the heavily vineyards laden. You can have a look at the two locations including Ba Moi vineyard and Thai An vineyard. 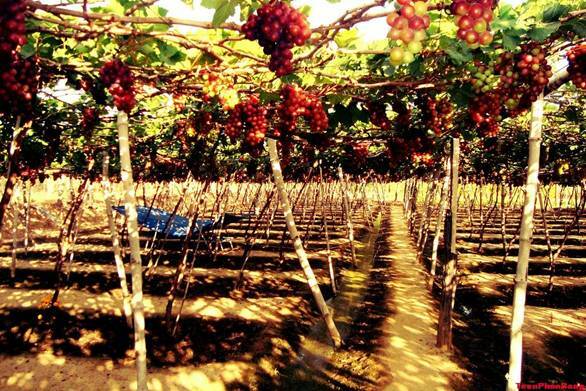 Here, visitors can enjoy the immense space of the vineyards and enjoy the great taste of Ninh Thuan grapes. The vineyard is also a great base for a beautiful picture of those who like taking photos. The vineyard owners are very hospitable, so you can enjoy taking pictures without paying any extra charge. 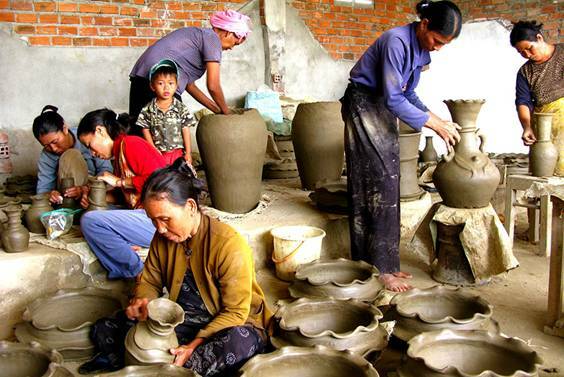 From Ba Moi vineyard, driving along the provincial road about further 5 km, you will come to Bau Truc pottery village. As the oldest pottery village in Southeast Asia, it has produced the unique, sophisticated ceramic products characteristic of Cham culture. Visit the pottery village, visitors can observe the production process of ceramic crafts from the hands of the village artisans. Specifically, you can manually make the pottery under the guidance of the hospitable pottery kiln owners. After sightseeing, tourists do not forget to buy some unique pottery products with affordable price for your friends and your relatives. 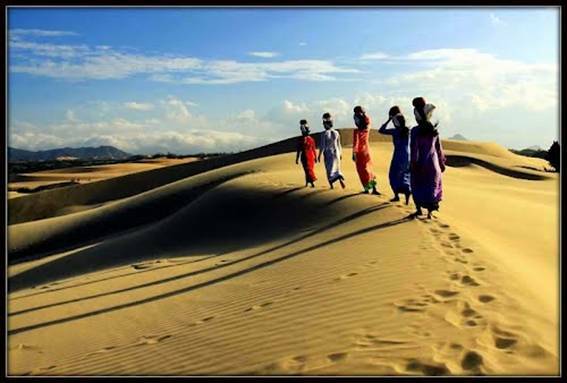 The ideal stop for exploring Phan Rang city in late day is Nam Cuong sand hill. 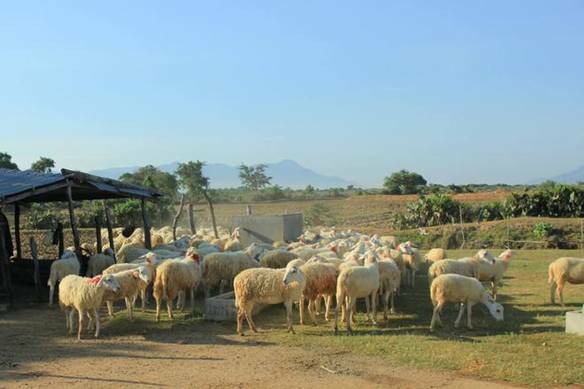 From the village of Bau Truc pottery, you go long the road towards the city center of Phan Rang and will see a small road leading to Nam Cuong sand hill. With the sand dunes stretching out into the sea, Nam Cuong sand hill looks more fanciful at sunset. Tourists can panoramic view to the coast or towards the vineyards, apple orchards and stretching to the bottom of the sand hill. Occasionally, you can enjoy a peaceful setting with flocks of sheep wandering graze in the foothills. One day seems to be not enough to discover the beauty of a city; but to Phan Rang, you absolutely can feel and enjoy all the attraction of this sunny and windy city in less than 24 hours. What's hot in China's happiest city?